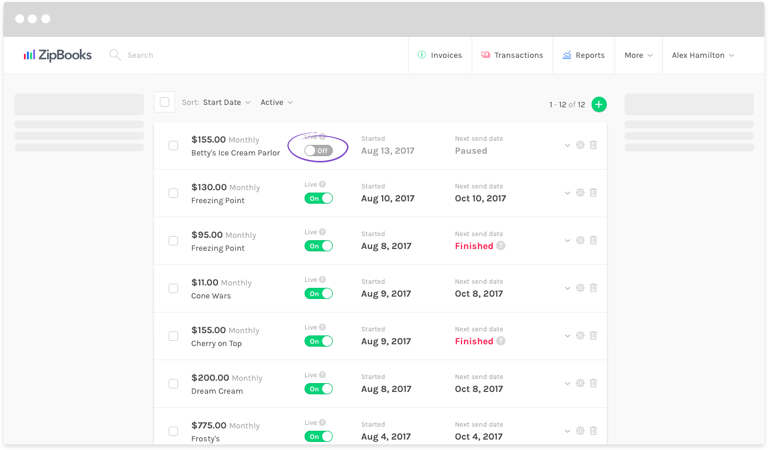 When you set up a recurring profile, you may have times that you need to put it on hold, to keep invoices from being sent automatically. Log in to ZipBooks and click on Invoices at the top of the screen. Click on Recurring Profiles in the menu on the left. Find the profile you need to pause in the list. Slide the Live button to Off. The word Paused will now appear in the Next send date area. Invoices for this customer won’t be sent until you make the profile active again. To do that, simply slide the Live button to On.